Ajax stunned all of Europe when they thrashed thirteen times European Champions Real Madrid at their home ground at Santiago Bernabeu last week. The young Ajax side played outstanding football in the Spanish capital and sealed their progress into the last-8 of the tournament. Goals from Hakim Ziyech, David Neres, Dusan Tadic and Lasse Schone were enough to send Real Madrid out of the competition as they succumbed to a 5-3 defeat on aggregate. Although the Dutch team’s attack was the centre of all attention after the game, it was actually the team’s midfield that did most of the job. The midfield trio of Schone, De Jong and Van de Beek outplayed the likes of Modric, Casemiro and Kroos in the centre of the pitch. 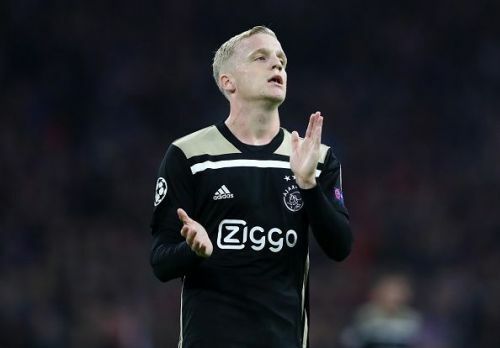 Van de Beek arguably was Ajax’s best player on the pitch. While the 21-year-old is not much appreciated for his works on the pitch, he is one of the best young midfielders in the world currently. He might not be in the spotlight like his teammates but his tireless work on the pitch does not go unnoticed. He has attracted interest from some top European clubs like Tottenham Hotspur and Liverpool. Having scored six and assisted seven in 24 Eredivisie appearances this season, he has earned a WhoScored rating of 7.17 for his consistent performances. The young midfielder is very exciting to watch on the field. He is quite unpredictable with his incisive passing and amazing skills on the ball. Van de Beek is like a young Andreas Iniesta. He likes to play short passes in order to build up the game. He possesses fair amounts of dribbling skills and has an incredible vision. The Dutch youngster is a complete midfield player who keeps his position quite well on the pitch and always impresses whenever he has the ball at his feet. Against Real Madrid, he was the one who was responsible for providing energy to the entire team. The Real Madrid midfield comprising of Ballon d’Or winner Luka Modric, World cup winner Toni Kroos and Casemiro was not able to handle the 21-year-old. He surely gave a hard time to the Real Madrid defence as his passing and movement were causing havoc in the Los Blancos penalty area. The young midfielder is very intelligent - he knows the right time to make the right pass and he also knows when to keep the ball. Van de Beek is very alert and aware of his surroundings and he always seems quite cool on the ball. Playing in the centre of the field, he is technically fit and just like Iniesta, he is good at making things look easier than they are actually not. It is a rare quality but that’s one thing that makes the Dutchman so special. Ajax has a lot of top young players in its team currently. With Frenkie De Jong making a big-money move to FC Barcelona in the summer, the likes of De Ligt, Neres, Ziyech and Van de Beek will also be attracting a lot of bids in the summer. Playing the Ajax way, Ajax have shown they have enough talent to compete with the best.